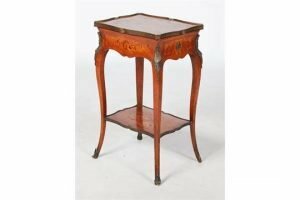 A late 19th century French kingwood, marquetry and gilt metal mounted occasional table, the shaped rectangular top inlaid with panel of stag, dogs and bird in a woodland glade with waterfall, above a gable end frieze drawer backed by a false drawer, raised on tapered cabriole supports united by a floral marquetry inlaid under tier. 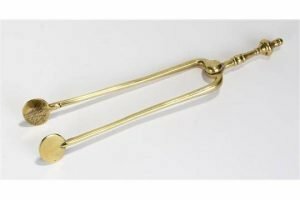 A late 18th Century pair of brass ember tongs, with a knob and ring turned handle, tapering arms and circular pads. 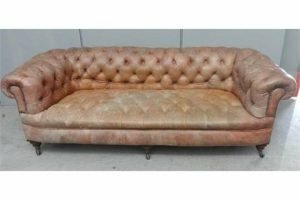 A large Victorian 3 Seater Deep Buttoned Pale Tan Leather Chesterfield on 3 turned front supports with brass & ceramic castors. 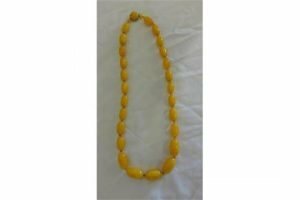 A large Butterscotch Amber graduated oval bead necklace, interspaced with small clear beads, lacquered yellow metal clasp, cabochon set, 25 beads + catch. 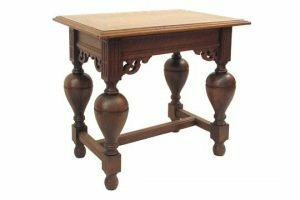 A Dutch solid oak side table Renaissance style, late 19th/ early 20th century. The moulded rectangular plank top on a plain frieze with corner supports. On four bulbous cup and cover shaped supports joined by a stretcher. 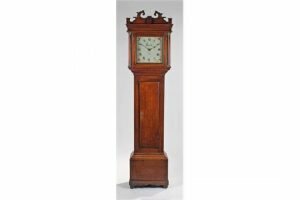 A Jarvis Watton oak cased long case clock, the white painted signed dial with painted foliate spandrels, the hood with a swan neck pediment and square glazed door flanked by columns, with a long trunk door above a base, thirty hour movement with an 11″ dial. 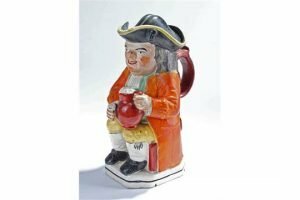 A 19th Century Staffordshire pottery Toby jug, the polychrome painted jug of a man seated with a foaming beer mug and pipe. 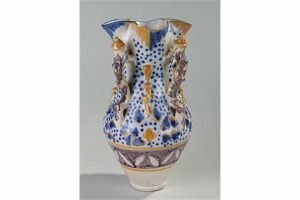 An early 19th Century Southern Italian Majolica vase. The polychrome vase with quatrelobed rim, applied with four manganese handles. The body with blue dot and flower design. 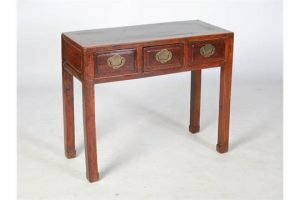 A Chinese dark wood console table, 20th century, the panelled rectangular top above three frieze drawers, raised on four square section supports with slightly inverted foot detail. 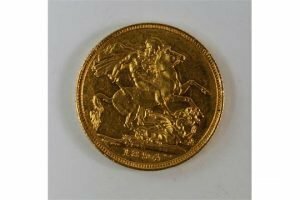 A George V gold sovereign, 1913. 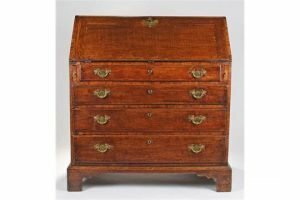 A George III oak bureau, the rectangular top with a sloping fall enclosing a series of small drawers and pigeon holes, with four long graduated drawers on bracket feet. 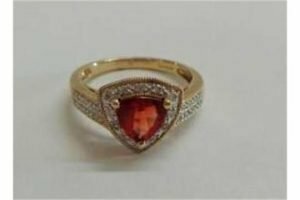 A 9 carat Yellow Gold triangular facet cut sunstone ring with diamond points, bifurcated diamond set shoulders. 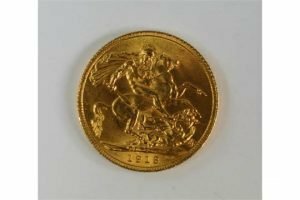 A Victorian gold sovereign, 1894. 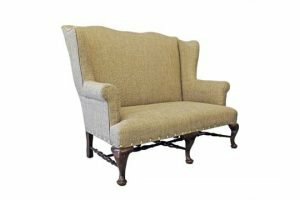 A walnut wing settee in early 18th century style, the serpentine back to scroll arms and on cabriole legs and pad feet, united by baluster turned `H` stretchers, English late 19th century. 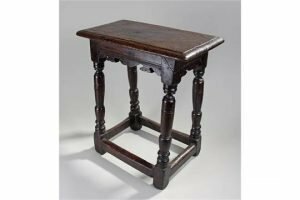 A 17th Century oak joint stool, the rectangular top with a moulded edge, turned legs untied by stretchers, block supports. 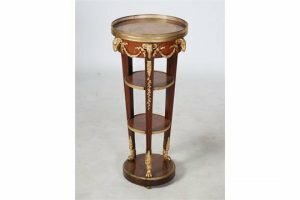 A late 19th century French rosewood, marquetry and gilt metal mounted gueridon, the circular top with pierced gallery and inlaid panel depicting maidens and clouds, above a frieze set with six rams masks and laurel garlands, raised on three tapered rectangular supports with foliate cast paw feet resting on a circular plinth and three bun feet. 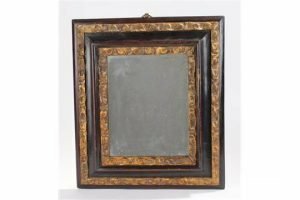 A George III mahogany and gilt gesso wall mirror, the rectangular mirror plate with gilt gesso border, arched mahogany border and conforming gilt gesso border to the mahogany edge. 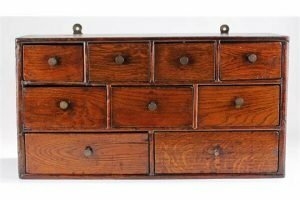 An oak spice cabinet incorporating 18th Century timbers. The rectangular cabinet with a series of nine drawers. 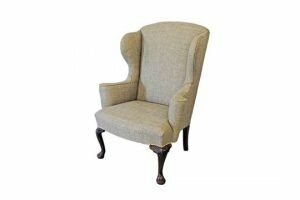 A walnut wing armchair in early 18th century style, with scroll arms on leaf capped cabriole legs and fluted pad feet. English late 19th century. 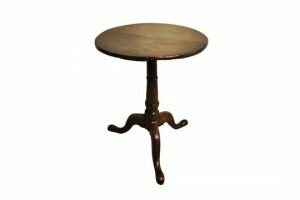 A solid oak side table, English 19th century, with turned column on three cabriole legs, with fixed circular two plank top.